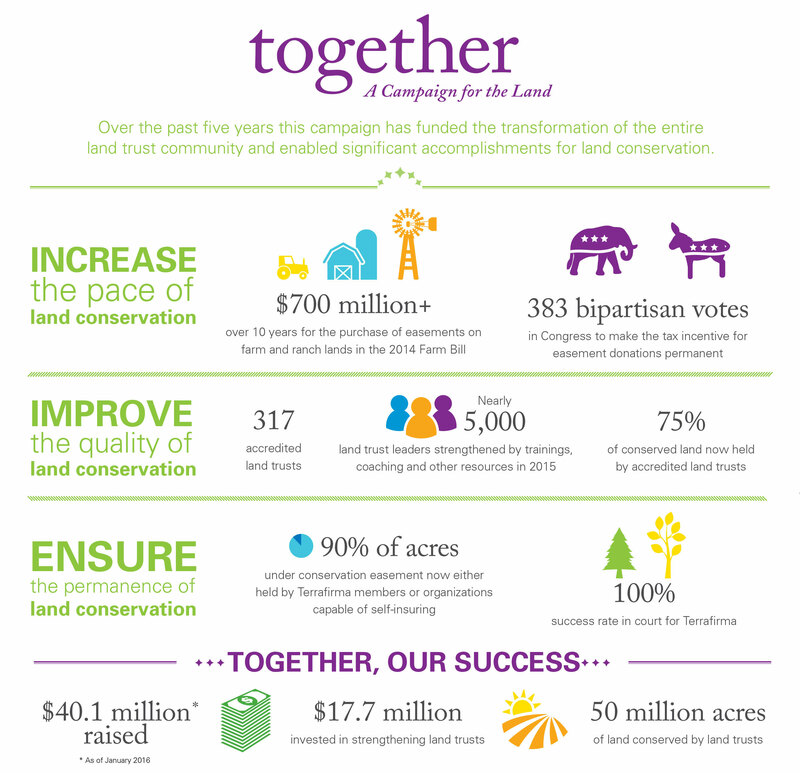 The Land Trust Alliance yesterday announced the completion of its first campaign, which raised $40.1 million in new funds. The total is more than $5 million above the campaign goal. Used to increase the pace, improve the quality and ensure the permanence of land conservation, campaign funds were reinvested as they were received across five years. The resulting initiatives — such as making permanent a federal tax incentive for land conservation and establishing the Terrafirma Risk Retention Group — have transformed the entire land trust community. Explore our infographic and press release to learn more. The success of this broad-based fundraising initiative was made possible by the generous support of the Alliance’s many partners, funders and donors. Campaign leaders included: David H. Anderson, honorary chair; Michael P. Dowling, campaign co-chair; and Frederic C. Rich, campaign co-chair. The campaign cabinet included: Robert A. Ayres; Alan M. Bell; Lauren B. Dachs, campaign vice-chair; Peter O. Hausmann, chair of the National Council; Sherry F. Huber, campaign vice-chair of regional committees; Ted Ladd, campaign vice-chair; and William Mulligan. Regional campaign committees included chair Ted Ladd, Lisa Cashdan, Scott Dickerson, Jameson S. French, Sherry F. Huber, Laura A. Johnson, Mary McFadden, J.D., Nicholas J. Moore, Julie Sharpe, Steve Small and Peter Stein for the New England region; co-chairs Peter O. Hausmann and Frederic C. Rich, Christopher E. Buck, Marjorie L. Hart, Alice E. Hausmann, Tony Kiser, Fernando Lloveras San Miguel, Caroline P. Niemczyk and Michael A. Polemis for the New York/Mid-Atlantic/Puerto Rico region; co-chairs Alan M. Bell and William Mulligan, David Hartwell, Kathy K. Leavenworth and Judith Stockdale for the Midwest region; chair Lauren B. Dachs, Maria Elena Campisteguy, Anne Kroeker, Glenn Lamb, Richard Leeds, Thomas S. Reeve and Darrell Wood for the Pacific region; and co-chairs David H. Anderson and Robert A. Ayres, Lise H. Aangeenbrug, Laurie Andrews, Michael P. Dowling, Lawrence R. Kueter, Penelope H. Lewis and George S. Olsen for the Rocky Mountain/Texas region. Josh Lynsen is media relations manager for the Land Trust Alliance.